The original title of this post was to be “A Salute To All Things Norway, But Mostly Trolls, Anorexic Polar Bears, Oil Rigs, and Children of the Corn” but that was deemed a tad too wordy by the editors. Title notwithstanding, I’m excited to take you on an exciting 24,248 word adventure/dissertation on the cultural significance, anthropological underpinnings, and guest psychology surrounding the Maelstrom boat ride in Epcot. Hope you’re ready for some fun!!! As my posts over the years have suggested, I’m a big fan of some of Walt Disney World’s less popular attractions and I honestly believe many of these attractions are superior to popular attractions in their respective parks. I’ve ardently supported Country Bear Jamboree. I’ve pontificated on the merits of Carousel of Progress. I’ve even presented my case for believing Impressions de France is superior to Soarin’. I’ve even wrote a treatise complaining about that big hat so many people seem to love. So does it really come as any surprise that I’m a fan of Maelstrom? The difference in the case of Maelstrom is that I realize Maelstrom is flat out bad. Laugh out loud bad. So bad that it’s good. I enjoy a lot of media like this, most of which I’d describe as campy, kitschy, or self-aware and self-deprecating. I enjoy movies like the Leprechaun series that don’t purport to have any artistic merit and are acutely aware that their whole premise is a big joke. For those who don’t hold the same zeal as me for the brilliant Maelstrom attraction, let’s examine Maelstrom. There’s a lot to love. The excellence starts out in the queue, after guests pass through some dank hallways themed to emulate the mold-infested buildings of Norway(?). How many of you have picked up on the exceptional details of the discolored ceiling tiles here? Brilliant and incredibly subtle storytelling! From here, I’m not exactly sure what happens. I usually cover my eyes for the duration as I fear gazing into the eye of Mara. I think your ride boat starts by taking you through a modern day Norwegian village…where something has gone terribly wrong! Everything is on fire and all of the village people have entranced, vapid blue-glowing gazes as if they are possessed. Spooky. I always assume this is the result of someone in my boat having looked Mara in the eye. Next the boat goes up a hill where we encounter a three-headed monster (presumably Mara’s handiwork) and some rad state of the art fiber-optics before changing directions and going backwards down another hill (look out: hairpin turn!). This is really the highlight of the attraction, and given that it was built in the late 1980s, I’m not sure what all the “Everest is state of the art” hubbub was about when Expedition Everest ripped off Maelstrom’s design some 25 years later. At this point, the boat quickly passes some puffins and a herd (that’s what groups of bears is called, right?) 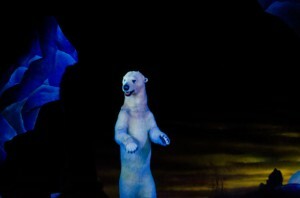 of anorexic polar bears before passing a Hidden Troll (why aren’t there books devoted to spotting these in Walt Disney World?!) and again changing directions. Finally, the attraction passes down a hill and culminates in a glorious three-hour finale featuring stormy skies and some oil rigs. I believe these oil rigs are somehow symbolic or help tell an elaborate 29 page backstory that explains away why a travelogue dark ride would feature such an eclectic and gloomy assortment of stuff. When it’s all over, guests exit into a port town complete with store fronts and pass through a theater without stopping for the film (this last part is key). If you haven’t experienced Maelstrom yourself, yeah, it’s just as awesome as it sounds. It is best described as campy–it has such an odd mix of elements and they’re presented without much rhyme or reason. I wouldn’t describe it as kitschy or self-aware, as it appears that the point of the attraction when it was built was to share some of the folklore of Norway along with some of its present culture and wildlife with a travelogue tone, but the execution totally missed the mark or the attraction hasn’t aged well. The result is chuckle-inducing content around every turn, and lines of dialogue that are memorable not because they’re poignant, but because of their cheesy content and delivery. 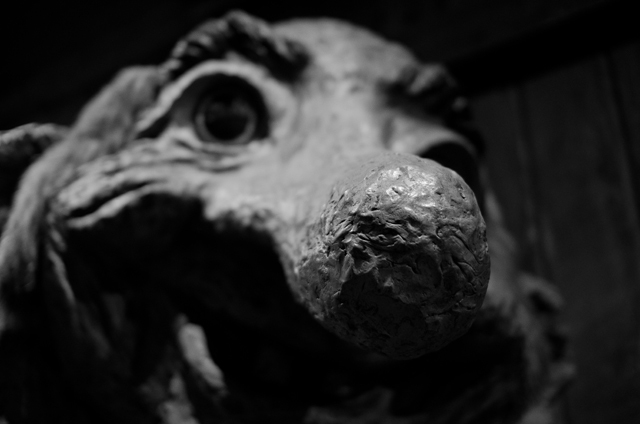 I love Maelstrom and I think it’s a lot of fun, but not because of its substantive quality. I love it because those corny scenes and the laughs I’ve had about them with others, the dialogue, and even the smell of the attraction, are all firmly embedded in my memory. I like it for the same reason I like the Leprechaun films–because it’s fun and absurd. 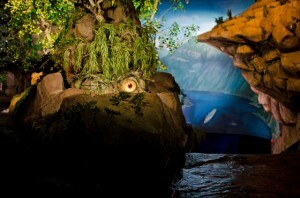 Although I love it, one thing I always wonder after we exit Maelstrom is what purpose the ride serves? The goal of most World Showcase pavilions is to pique guests’ curiosity about these foreign lands, and entice them to visit. That’s why the countries and corporations within the countries agreed to sponsor them in the first place. Every other pavilion does this pretty well by showcasing the beauty and charm of each country. I would argue that the films in Canada, China, and especially France do the best job of “selling” their respective countries. Norway, on the other hand…well…can anyone honestly say that they’ve felt compelled to visit Norway after riding past some creepy glowing eyed village-people, misshapen polar bears, oil rigs, and trolls? The sad thing is, from what I’ve seen and read independently, Norway is a beautiful and charming country with a lot of history, but absolutely none of that is conveyed in Maelstrom. I think this irony might make Maelstrom even more awesome for me. 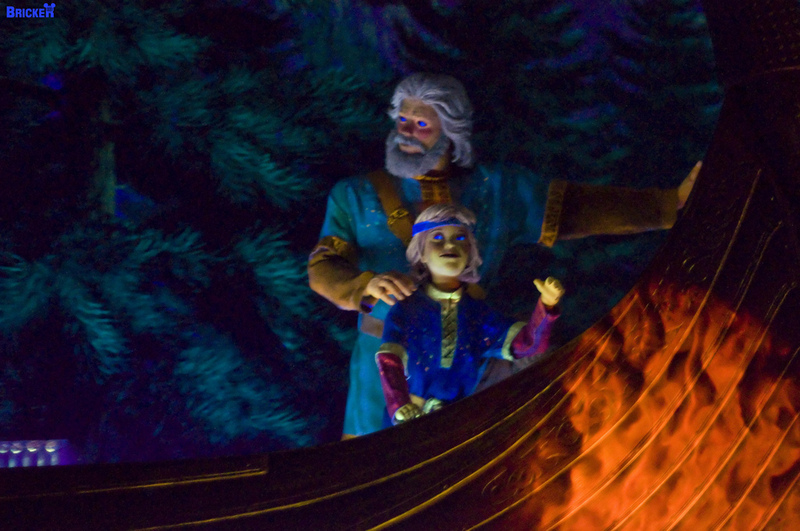 For all of these reasons, no visit to Epcot is complete without a ride aboard Maelstrom. While I’d really like to see it completely overhauled and replaced with something that I enjoy because it’s actually good, part of me would mourn the loss of such an unintentionally fun romp through troll country. 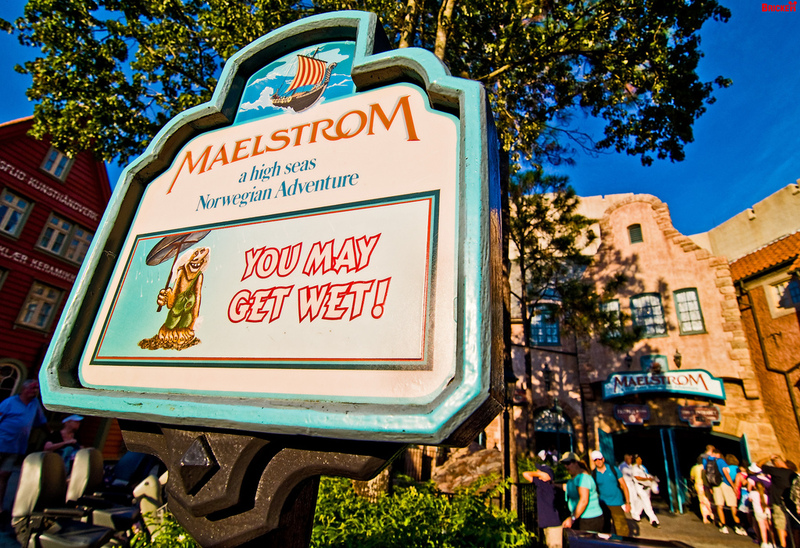 If for some reason you haven’t experienced Maelstrom yet because you’ve heard it’s bad, give it a chance. You may find yourself agreeing with me that it’s so bad that it’s good! What do you think of Maelstrom? Do you enjoy it for its unintentionally humorous qualities…or do you actually think it’s a good attraction? Share your thoughts in the comments! You left out the hair! The people in the mural have such beautiful, flowing blonde hair. I love Maelstrom, but I won’t wait in line for it. I ride it on most passes through World Showcase. I think the ride keeps with the overall intent of Imagineers when they designed the World Showcase pavilions and attractions: I read that they wanted guests to find what they EXPECT they would find in these countries, not what they would actually find if they visited them. On that I think they hit the mark perfectly with Norway/Maelstrom. Though an Ice Station Cool-style freezing room would have been a nice addition…I expect to find a lot of ice and cold in Norway. Fair enough explanation of what WDI was going for…but even if that’s true, if you’re a pavilion sponsor and your aim is showcasing your country in a manner that promotes it, why on earth would you agree to Maelstrom? IS SOMEONE PAYING TRIBUTE TO TROLLS? I THINK YOU SHOULD HAVE WROTE THE WHOLE BLOG IN CAPS. Oh wait I’m sorry, wrong trolls. This is the kind of trolls I thought you were writing about at first too! And don’t forget the spirit of Norvay! We always exit the ride chuckling to that one. I love Maelstrom. I remember being an excited 8 year old reading my parents’ “Official Guide” (before I grew up and went rogue with the UG) leading up to our big 1991 Disney trip when Norway had just opened. The guide made the new ride seem so exciting. While not as thrilling as Birnbaum promised me, years later it is still just as fun for all the reasons mentioned in your tribute. For some reason I do not have the same reaction the Mexican boat ride. While it is also ridiculous, it’s nowhere near as funny/entertaining. I enjoy Gran Fiesta Tour. Not as much as Maelstrom, but I think it’s less nonsensical than Maelstrom. It has a catchy song, some cute visuals, but it just doesn’t have the same spirit (of adventure). I miss the song from El Rio del Tiempo. THAT was catchy 🙂 I could get behind that ride if it used the old music. Makes my day when that comes on Mouseworld Radio. I also feel like I’m unfair towards GFT because I’m a Spanish teacher and there are a few parts of “the tour” that make me cringe. Maybe all those teachers of Norwegian feel the same way when they ride Maelstrom? I know my kids loved it when I repeatedly yelled “TROLLLLL!” as we went through the ride. The best part of this ride is standing outside, watching the boats back into the rock and listening to the water. And not only do I like Maelstrom, I like the movie, for the same reason you cite in the article–it’s so bad, it’s good. I always want to stop and watch it, and my family just roll their eyes and head for the gift shop. I keep trying to convince Sarah that we need to watch the movie. I can’t recall ever having seen it. She’s heard so many negative things, and what we’ve seen in passing looks so dated that I can never convince her. Next time!!! You left out the perfume smell as you are forced to walk thru the gift shop after the movie. It is so strong I have to hold my breath as I quickly pass through. Honestly, I LOVE that perfume (Laila). Probably because it reminds me of World Showcase and not due to its actual quality. I almost bought some for my wife! Personally, I loved your first title and the allusion to Sam Eagle. Also, those trolls are scary. Yikes. As another lover of ‘bad-good’ things (i.e my horror film of choice this Halloween is Flipper..) I love this ride too! But Tom, am shocked you’ve never seen the film! I (sadly) don’t visit often enough to quote it (cursed Atlantic Ocean) but memory is good enough to tell me it’s as cheesy and giggle inducing. 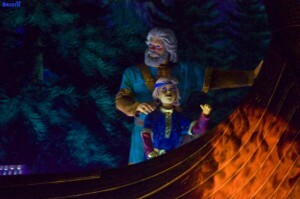 I have to say, every time I ride Maelstrom, it actually makes me want to visit Norway. The ride is so odd, I can’t help but think Norway might just be as quirky and interesting. My sister is obsessed with Maelstrom, for many of the reasons you list above. She makes us ride it multiple times each visit. Last time I used the time honored “drink a couple margaritas at the Mexico pavilion before getting on the ride” trick. That greatly enhanced the ride and my sense of adventure. To all those sitting with the crazy girl at the back of the boat yelling “you can’t control me, you troll”, I sincerely apologize. Oh, and one time we also splurged for the perfume. It reminds me of our great trip to Disney every time I put it on. Definitely get some for Sarah next time! Oh, your article had me laughing so hard! I can’t tell you how many times I have had those thoughts. I make my kids go on it every time because of my memories of loving it as a kid. They can’t believe how ridiculous is it, and they were 8 and 10. The eye rolls and groans said it all! And they run through the movie theater at the end as though the doors might actually close, trapping them, and they would be forced to watch a movie as awful as the ride! To be fair, they have started embracing the cheesiness more as they age. They now like the Troll. I think Maelstrom is a wonderful attraction on many levels. We never miss an opportunity to enjoy it, sometimes several times in a row. Everything that remains virtually unchanged can’t help but pick up at least a few elements of ‘camp’ over the years, and there is a lot of history crammed into a short boat ride. But let’s be fair: Norway and the surrounding countries measure their history in centuries and get a few short minutes to tell us about it while over in The American Adventure the Imagineers had a huge budget and lots of time to tell us a story that’s only a few hundred years old. The travelogue does need to be updated; it’s a shame the egress from the attraction forces people to hurry in between those who would watch and those who prefer to keep moving. Whatever the author’s intent with this article, all I got was a sense of disrespect and a mocking tone. I didn’t find it funny or clever, or even helpful. Fair points regarding the budgets for the respective attractions. I too love this attraction. It is just plain silly fun. My brother still has the troll he bought from the gift shop about 20 years ago. I also laugh at memories of me kicking & screaming when I was a little one because I was afraid we were going to fall down the waterfall! Good times! As for Tom’s sense of humor. I don’t think laughing at life is harming anyone. Keep up the excellent writing. Great article. 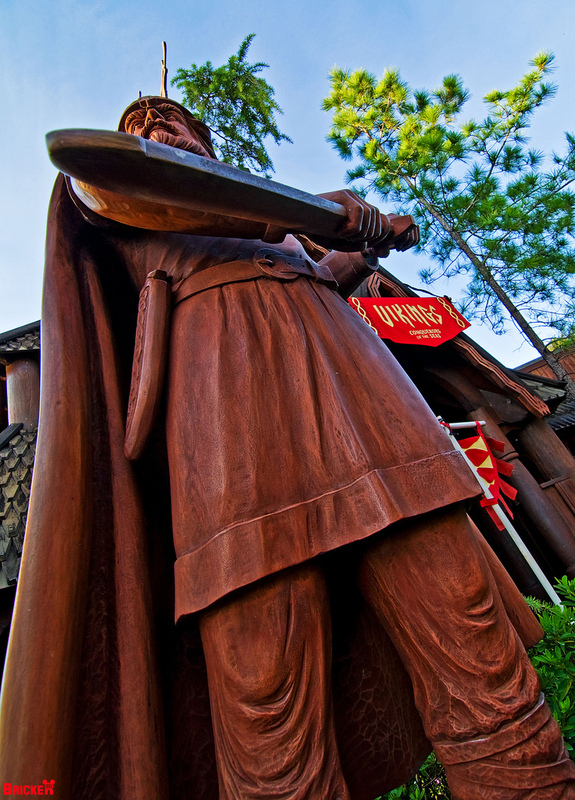 Norway is my favorite EPCOT pavilion. I love the Viking exhibit hidden inside the old Stave Church as well. I bought my wife the perfume they sell there, and I really enjoy the Spirit of Norway film. A lot of people think it is dates, but I really like the winter scenes in the film. The Maelstrom is a fun ride – and I love the ambiance it creates. IT makes you feel like you are not in the middle of Florida. Well, we love the ride, not just for the campiness. I feel like you get a sense of the scale of a small country. I do have to say that we have been trapped multiple times and forces to watch the film. I would voluntarily watch it again, but don’t appreciate being trapped and kept from riding multiple times through. If you were to stay through the movie, you would notice the further camp-rific soundtrack that is not too dissimilar to Captain EO’s pre-show movie soundtrack. 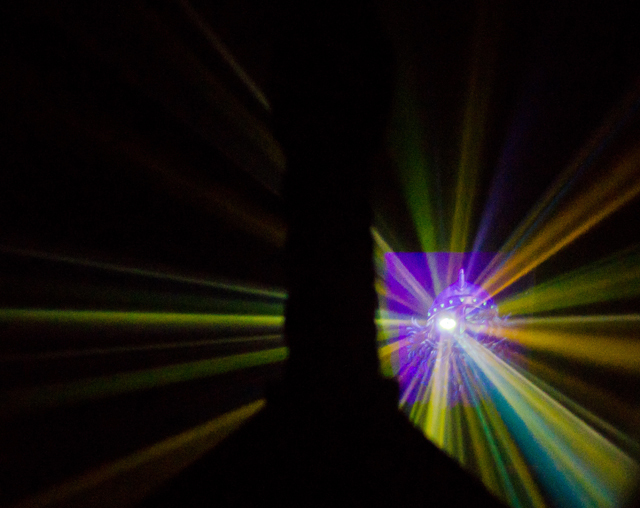 Heavily reverbed tom drums (a la Phil Collins), synth-laden music! Deliciously Campy! …And you can’t help but get a little tear in your eye when the little child puts his hand on the boat. Tom, DUDE!, you have GOT to see the movie. What that little kid “gets” just from looking at the hull of an old boat… Truly this is “Journey Into The Imagination a la Norvay”. I actually mentioned the Chuck Norris image to the young Norwegian guy who was loading the ride. He hadn’t noticed, but thought it was very funny. I have dubbed the image “Chuck Norse”, by the way. You’re welcome.